The concept of encapsulating a drug within a polymeric particle for delivery is not new, and it has been common practice for over 20 years to use micro- and nanoparticles as drug delivery vehicles. The polymeric material commonly used for such work is poly(lactic-co-glycolic acid) (PLGA). Until now however, commonly used encapsulation methods (such as high-shear mixing or sonication) have been ineffective and wasteful. By contrast, droplet microfluidic technology enables high encapsulation efficiency and the fabrication of unique formulations that are difficult or impossible to achieve using standard methodologies. This gives researchers access to variety of formulation that can be finetuned depending on the nature of the (API) and specific functional requirements. If the API is not soluble in DCM then other organic solvents, such as dimethyl sulfoxide (DMSO), can be used instead. Such solvents are used to dissolve the API and are combined with DCM for the emulsification process. 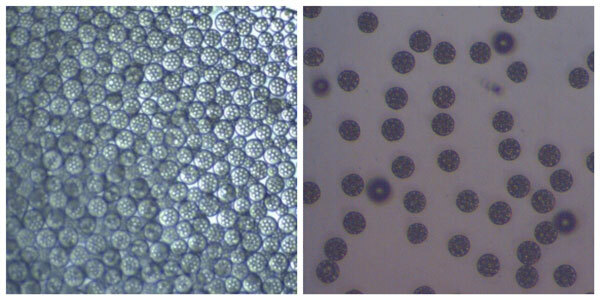 In both cases the resulting droplets are dried following a solvent extraction process. As the APIs are non-water soluble, the molecules are retained within the polymer bead when the organic solvent is removed. Therefore, the encapsulation yield resulting from this process is nearly quantitative. 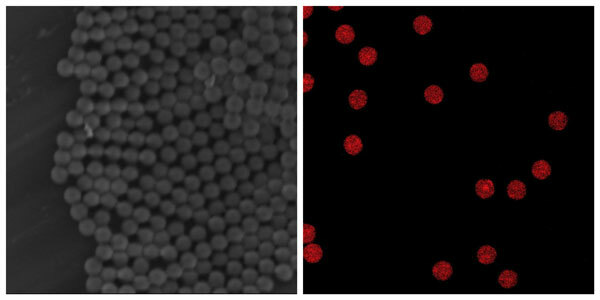 Scanning Electron Microscopy (SEM) image of PLGA beads encapsulating dissolved API (left); Fluorescence microscopy image of PLGA beads– red fluorescence indicates the positioning of the dug. In the case where the API can only be solubilized in water, a more innovative formulation must be applied. We recommend either direct powder encapsulation or multiple emulsion microfluidic methodology. In this case API is introduced into the formulation as a fine powder. The powder is suspended uniformly through PLGA solution in DCM and the suspension is kept agitated throughout the encapsulation process. The powder suspension is emulsified using microfluidic technology followed by the usual drying process. During the solvent extraction process the API powder cannot escape the bead due to the high surface tension at the solvent interface. The encapsulation yield resulting from this process is therefore nearly quantitative. In the case where the API must be dissolved in water prior to encapsulation, a multiple emulsion microfluidic method is required. The API is dissolved in water and is emulsified using a small droplet microfluidic chip (typically a 14 µm chip) to create droplets of approximately 2µm diameter. 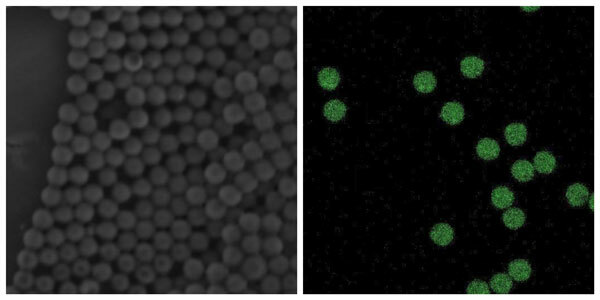 This primary emulsion is then transferred to a second, larger chip (typically 100 µm) where second emulsification process, PLGA droplet formation, occurs. This multiple emulsion microfluidic method results in PLGA droplets containing multiple API loaded water droplets. The PLGA droplets are then dried following a solvent extraction process. During this step, the primary API water droplets remain intact in size and quantity. The encapsulation yield resulting from this process typically exceeds 90%. As shown above, Microfluidic methods allow selection of the best option for preparing the API for encapsulation, coupled with very high encapsulation efficiency. In addition, by tuning the channel geometry and fluid flow rates, PLGA particle size can be defined precisely and delivered with excellent monodispersity. This performance can be maintained across the range from lab scale to production by “numbering up” the microfluidic channels. If you’d like to learn more about other specifics of API encapsulation or different methods, please contact our team of experts. Dolomite has expertise on hand to talk about your needs and help validate the approach in your context.